"Over the past 15 years air temperatures at the Earth’s surface have been flat while greenhouse-gas emissions have continued to soar" begins The Economist article, "A sensitive time" that reveals deep cracks in the human-caused-global-warming movement. Real world global temperature measurements that have revealed a lack of any significant climate change over more than a decade are impressively damaging the human-caused-global-warming movement. In fact, so much doubt has now been cast on the false "consensus" of human-caused-global-warming that activists who have long championed the fight to reduce fossil fuel use are now having second thoughts. A case in hand is found in the March 30th article, "A sensitive Matter" appearing in the UK's The Economist magazine which admits, "The climate may be heating up less in response to greenhouse-gas emissions than was once thought." In point of fact, the planet does not heat up at all in response to greenhouse-gas emissions. "Over the past 15 years air temperatures at the Earth’s surface have been flat while greenhouse-gas emissions have continued to soar. The world added roughly 100 billion tonnes of carbon to the atmosphere between 2000 and 2010. That is about a quarter of all the CO₂ put there by humanity since 1750. And yet, as James Hansen, the head of NASA’s Goddard Institute for Space Studies, observes, 'the five-year mean global temperature has been flat for a decade.'" This is a dramatic departure from Hansen's claims in the 1980s which predicted much higher temperatures for the early 2000s. "Carbon dioxide itself absorbs infra-red at a consistent rate. 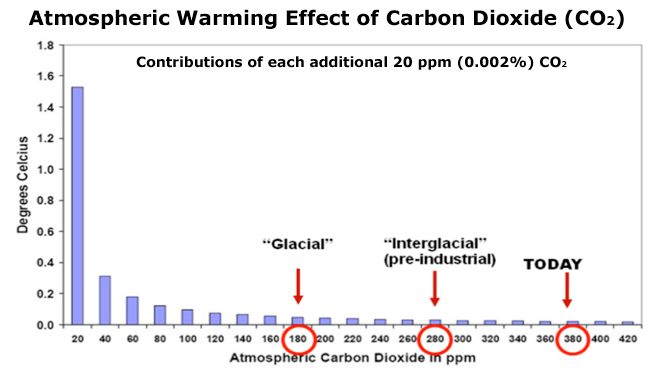 For each doubling of CO₂ levels you get roughly 1°C of warming. A rise in concentrations from preindustrial levels of 280 parts per million (ppm) to 560ppm would thus warm the Earth by 1°C." This statement is both scientifically incorrect and grossly misleading. In point of fact, the warming potential for atmospheric CO₂ decreases logarithmically as atmospheric CO₂ decreases! 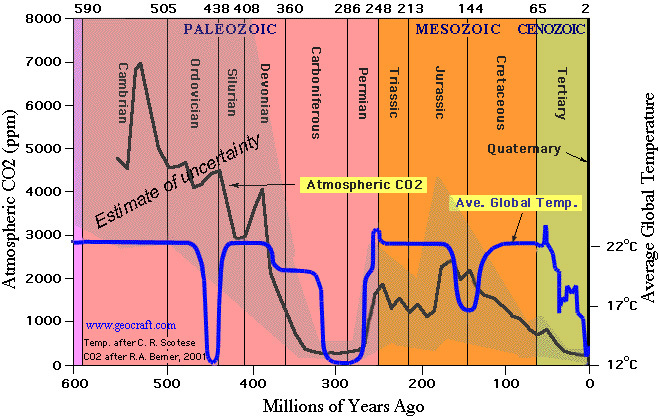 Geologic reconstruction of past climate (see figure below) shows a sharp DROP of 10°C during the late Ordovician of the Paleozoic (~488 to 444 million years ago) while atmospheric CO₂ levels INCREASED from ~4100 ppm to 4500 ppm. This climate change reflected the onset of one of the coldest Ice Eras in Earth's climate history and demonstrates conclusively that there is no causative relationship between atmospheric CO₂ and global average temperature. This non-relationship is clear over the past 600 million years during which Earth has experienced four Ice Eras of varying intensity and duration, among which is included the current Ice Era which began about 60 million years ago. "Human beings have never experienced the earth's normal climate. For most of its 4.6-billion-year existence, the planet has been inhospitably hot or dry and utterly devoid of glacial ice. Only seven times have major ice eras, averaging roughly 50 million years in length, introduced relatively cooler temperatures; humankind arose during the most recent of those periods [which continues today]." — from Time-Life "Planet Earth" series, "Ice Ages"
Failure to put climate change in its proper prospective is a major tool of those advancing the false theory that human activity is warming the planet. In fact, current warming is well within natural boundaries and is even within the cooling phase of our current interglacial (the Holocene interglacial) that began about 12,000 years ago and is due to end. Atmospheric CO₂ level is rarely as low as it is today. If the level drops too low (much below 200 ppm), all plant life will be extinguished and all other life will necessarily become extinct. There is no corresponding catastrophic outcome for increased atmospheric CO₂. Most of today's plants evolved during much higher levels of atmospheric CO₂ and are somewhat starved for this essential fertilizing gas that is critical to their development and survival. The claim of planetary warming by rising CO₂ levels is not only erroneous, it is scientifically impossible, given the atmosphere is a colder body than the planet's surface and a cooler body cannot increase the temperature of a warmer body no matter how much sleight of hand in dubious "pseudo-physics" is tried. It is amazing the contortions that advocates of global warming theory contrive to try to deny this elementary law of physics. A planetary atmosphere moderates global climate. It neither heats it nor cools it because it neither adds nor subtracts energy from the Earth-Sun relationship (it merely moderates the process). Apparent correlation of global temperature and atmospheric CO₂ level over timeframes of hundreds of thousands of years (e.g., during Ice Age cycles) reveals an atmospheric CO₂ response to temperature changes, not the other way round. This is a consequence of the long timeframe required to heat and cool oceans (which cover 70% of Earth's surface) by natural solar variations. Natural heating and cooling alters the balance of CO₂ absorbed by cold oceans and emitted by warm oceans in a constant cycle driven seasonally, geologically, and orbitally. Observational counter-evidence proves the Anthropogenic Global Warming (AGW) theory deeply flawed. Those who adhere to the Scientific Method recognize that when any aspect of a theory fails experimental and/or observational testing, the theory must be rejected. An excellent example of the failure of AGW theory is it's own requirement that a dramatic mid-tropospheric (8-12 km altitude) "hot spot" must appear in a tropical zone (+/- 30° of latitude) as a consequence of human-caused "greenhouse" warming. The problem for AGW theory is that both satellite and weather balloon (radiosonde) measurements reveal no such hot spot and, in fact, to the contrary, measurements reveal a slight cooling is observed! (see chart below). Other AGW claims are equally dismissed by accurate measurements (as opposed to contrived proxy measurements) of sea levels and polar snow/ice accumulation and temperature. In each of these cases claims are exaggerated or falsified to create "evidence" of human-caused global warming that simply does not exist. "The mismatch between rising greenhouse-gas emissions and not-rising temperatures is among the biggest puzzles in climate science just now. It does not mean global warming is a delusion. Flat though they are, temperatures in the first decade of the 21st century remain almost 1°C above their level in the first decade of the 20th. But the puzzle does need explaining." In fact, the mismatch is not puzzling at all to scientists who have carefully evaluated the science associated with global warming claims and found it to be deeply flawed! And, yes, it does mean that one can correctly conclude that believing in a flawed theory is delusional. Finally, there is nothing puzzling about the 100-year change in temperatures of a mere 1°C when it is put in perspective of hundred-year climate change over the past 1000 years. Earth is still recovering from the Little Ice Age. It is supposed to be warming. A far greater threat looms in the relatively near future, that being the onset of the next Ice Age cycle as our current Interglacial climate ends. Both are due. There is much in The Economist article that is sound reporting. It's a shame the article is corrupted by the misleading information quoted above.